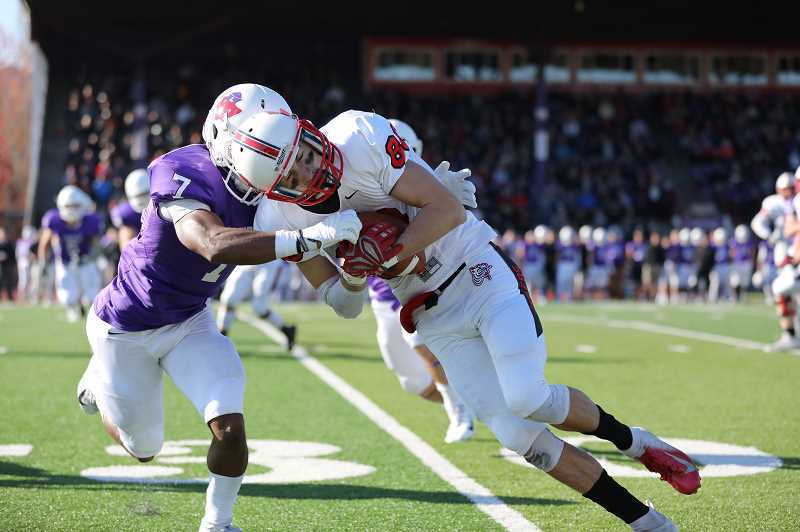 The Boxers allow 50 first-half points in defeat, finish season 5-5 and 3-3 in the NWC. Linfield scored 29 first quarter points en route to a 50-0 halftime lead as they defeated the Pacific University football team, 50-7 on Saturday, Nov. 10, in McMinnville. A pair of interception returns for touchdowns and the play of Wildcats quarterback Wyatt Smith, who completed 18 of 30 passes for 232 yards and four touchdowns, led Linfield to a 50-0 halftime lead. Smith spread the wealth, finding four-different receivers en route to his four touchdown passes. Pacific (5-5, 3-3 NWC) got on the scoreboard in the fourth quarter as Josh Harris ran it in from six yards out to cap a 15 play, 80-yard drive, following a successful fourth-down conversion and a pair of third-down opportunities by the Boxers including the touchdown by Harris. On the ground, Chidubem Nnoli picked up 108 yards on 14 carries and a touchdown. With the win, the Wildcats improved their record to 7-2 overall and 6-1 in the Northwest Conference. The Boxers held Linfield off the scoreboard for the entire second half. The Pacific defense held the Wildcats to 92 yards of total offense over the final 30 minutes. Despite the loss, Pacific had a pair of individuals write their names in the single-season record book. Boxer punter Dillon Savage added nine more punts to his total and 78 for the season. Sophomore wide receiver Ty Hargis had eight catches to finish the season with 83 receptions, eclipsing the three-year old record of 79 held by Kobe Williams in 2016. Defensively, Pacific was led by Cole Thomas in the loss, who had 11 tackles and a pass breakup in the loss for the Boxers.